Plan your dream wedding at Wains Hotel Dunedin. 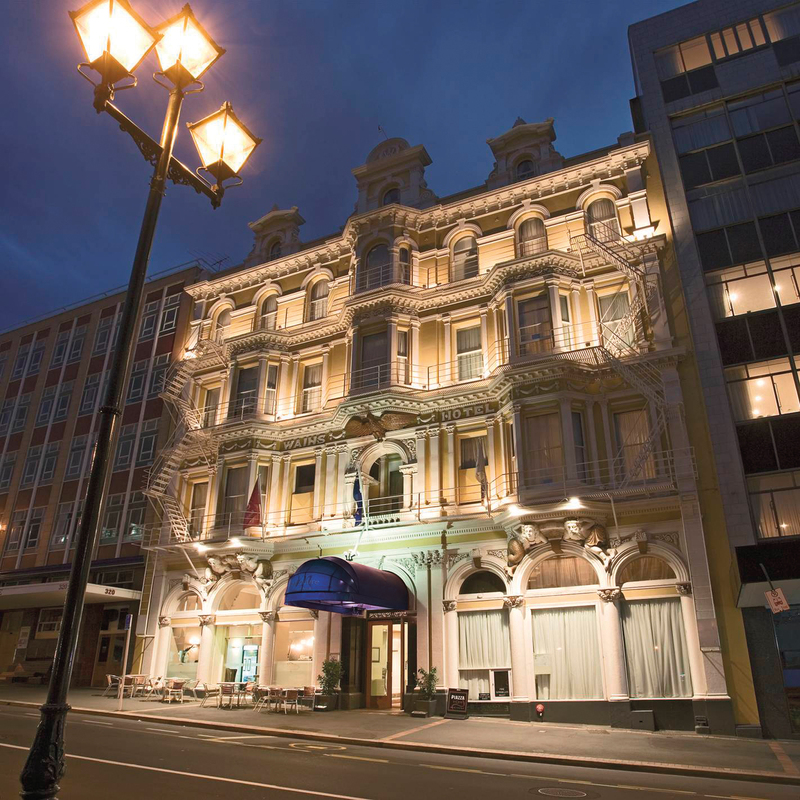 The venue is the perfect combination of past and present, with the ornate Victorian and Edwardian features that adorn both the interior and the facade of the building, combined with all the modern catering, conveniences and comforts you would expect from one of Dunedin’s most iconic hotels. The piece de resistance is the Chancellor Room and Lounge. The Chancellor Lounge, with its polished wooden floors and grand chandelier, embodies the magnificence of the hotel and provides the perfect spot for your first momentous dance together as husband and wife. Take the stress out of the day and make it an event to remember. The elegant venue, wedding menus, and decorations will be tailored to suit your requirements and budget. At Wains Hotel Dunedin, they aim to ensure that you and your guests cherish the memories from this, your most special of days, forever. Located in the heart of Dunedin, Wains Hotel Dunedin is housed in an elegant Victorian heritage building. This boutique-style property offers 48 rooms, all equipped to international hotel standards, including internet access and 24-hour in-room dining. Whether you are considering a simple meal or grand gala dinner, they have the facilities to accommodate your occasion. Wains Hotel Dunedin is just a short walk from the Octagon city centre and the many shops, restaurants, and entertainment venues that the city has to offer. Experience Dunedin in true style and enjoy the vast number of tourist attractions and activities on the doorstep, such as the Otago Peninsula with its colourful array of wildlife, a visit to the Cadbury chocolate factory, the history of Otago University, or a ride on the Taieri Gorge Railway. A dedicated wedding co-ordinator to help with planning. Attentive and experienced service staff for the duration of the night. Tables, chairs, cutlery, and glassware. Sound system - including roving and hand-held wireless microphone. Special accommodation packages for out-of-town wedding guests. Complimentary suite for your wedding night, including sparkling wine, breakfast in bed and a late checkout of 1pm. Complimentary parking spaces for three cars. Chair covers and bows: $8 per person. Toasting wine $5 per person. Table runners $5 per table. Flower centrepieces $30 per table. Mirror centrepieces $10 per table. Special-effect lighting for dance floor - quote on request.